The book is all about how to stay in the moment and focus on the target. In general, it is a handbook to enable golfers, both professional and amateur alike, to improve their mental game so that their mind doesn’t get in the way of their performance. Yogi Berra’s quote was about baseball. It really can apply to Golf, too. The sport is different from most others in that the golfer alone initiates the shot. The game does not depend on the interaction of other players. There is also a lot of downtime in between shots which allows the player’s mind to enter into the game. Thoughts of past or future play can impact the golfer’s current round, preventing them from staying focused in the moment. The mind can be dangerous when it comes to wrong thoughts. 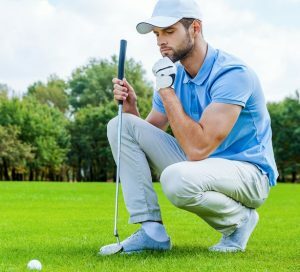 If a golfer remembers previous bad shots and what happened the last time they were in that situation, they may do the same thing in the present situation. If they think into the future, inevitably counting their score or figuring with just par or bogey on the next hole they will shoot “fill in the blank,” they lose sight of the present. The only thing that really matters is the next shot and the target of that shot. What happened in the past or could happen in the future is irrelevant. In sales, as in golf, it is also critical to stay in the moment. When a salesperson dwells on the past, thinking about the last time they were in a similar situation and what that prospect said or did; or when they think into the future, about the commission they are going to make, or how “they’ve got this one” and what they will tell their boss: They are skipping over the here and now. And, as with golf, the salesperson has a lot of time to listen to these internal thoughts, rather than focusing on the prospect or customer right in front of them right now, and their problems, thoughts, hopes, and aspirations. You see, when we get inside our own head too much, either in golf or in sales, we take our focus off the most important thing, which is external to our own head. In golf, it’s the next shot and where it needs to go. In sales, it’s our prospect and where they need to go. As golfers, we’re taught to establish a repeatable pre-shot routine. The idea is to train the brain to stay focused in the present by repeating something that doesn’t require thinking, thus closing the door on distracting thoughts. The physical component of the pre-shot routine helps re-establish muscle memory to execute the correct swing. If you’re not a golfer, just check out any televised tournament and you will see this in action with every player on the tour. I would suggest the same in sales. Establish a pre-call routine, go through it before every call and make sure to focus on the present, which is the prospect right in front of you and their dreams, hopes, and goals. If you would like a pre-call planning sheet to help with your mental preparation, contact us at info@braveheartsales.com. We will be happy to send you a sample. And, managers, we can actually measure your salespeople’s ability to maintain emotional discipline. If you would like to learn more, contact us at the same email address. Wonderful points, Gretchen! Staying focused in the present moment is a skill that brings peace of mind, no matter what field you work in. But with sports or sales, it can be especially hard to stay present. This is one of the reasons I love sales. It’s a great platform to work on mindfulness!